Video content is now an important part of the web and social media sites. Not just social media, for the blog as well. Uploading videos in WordPress blog directly by uploading on the server does not make sense. It not just consumes the space on hosting but also puts additional overhead on your bandwidth. So, it is better to upload the video on some social sharing websites and then embed it in your blog. So, many times there is a need to embed a video on the blog posts. While most of the video sharing websites or social media websites allow users to embed public posts and videos on their websites, WordPress has a simpler way. 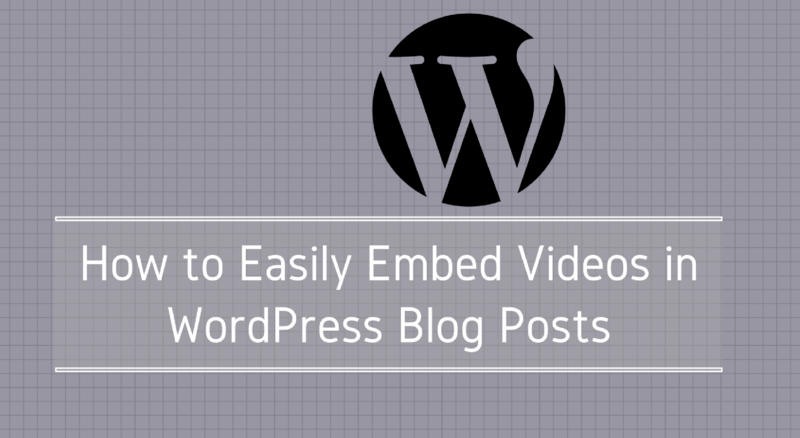 In this post, I am going to explain how to quickly embed any video on your WordPress blog post. In the recent WordPress versions, the auto video embeds feature. So, you no longer need to search for embed code and then paste in the text format on your post. Now, you do not need to leave the visual of your WordPress editor. Just copy the video URL and paste it into your WordPress editor. It will automatically fetch the video in the post. After this, you can save your post and click on the preview button to see the video embed in your blog post. I do not think there is anything else you need. If you still found a service that is not supported by WordPress for auto embed, you need to find the embed code of video to add in the blog post. I hope this article was useful. Sharing videos in the article is a nice way to increase engagement. If you own a YouTube channel or you create awesome videos, sharing it in the blog post also increases the reach of the video. So always try to embed videos. You can explore our website to get more relevant information about web design, WordPress, and blogging.